During the 4th quarter of Game 1 against the Brooklyn Nets, the Philadelphia 76ers found themselves down double-digits and constantly getting booed by their home fans for playing terrible. 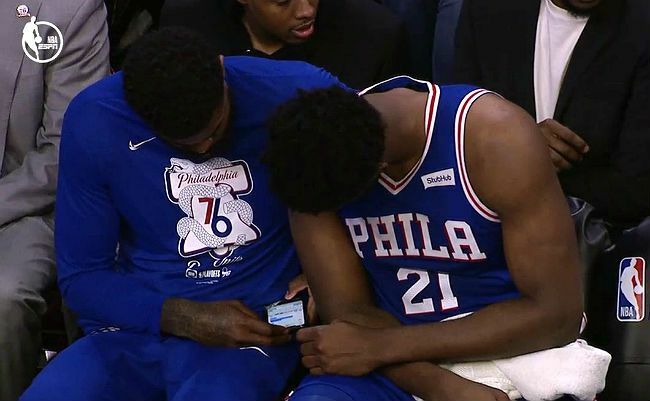 It went from bad to worse after ESPN cameras caught an Inactive Amir Johnson pulling out his cell phone and showing Joel Embiid some text messages during the game. Sixers send Amir Johnson back to the locker room for having a phone on the bench. Johnson would be sent to the locker room soon after and ultimately return before the end of the game. Even though both players were wrong,many fans took to Twitter and called out Doris Burke for snitching. Why did Doris Burke & @espn snitch on Amir Johnson? What’s it matter if he has his cellphone? Lol everyone doesn’t take this as seriously and shouldn’t. It’s just a game.